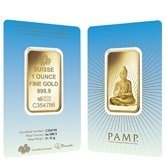 PAMP Suisse Mint, the subsidiary of MKS Switzerland, is a well-known worldwide bullion brand. The company was founded in 1977, in the southern part of Switzerland, Ticino. It produces a large and impressive variety of remarkable precious metal bullion products, most of them highly appreciated on gold bars markets. Produits Artistiques Métaux Précieux is famous for manufacturing its ‘PAMP Suisse Goldbarren’, as well as their silver equivalents. The company is a Gold List member of LBMA beginning in 1987 thanks to its approach of providing bullion products of the highest quality. The mint also provides precious metals alloys for jewelers and watchmakers, produces commemorative coins and medals, as well as blank coins for governments, financial institutions and central banks all over the world. Also, the mint is the official distributor of bullion coins for the United States Mint and Royal Mint, as well as other leading mints. It’s a globally recognized leader that was the first to incorporate the holographic feature to combat counterfeit bullion, to issue colored designs on bars and transform ingots into jewelry. This is why PAMP premium fine bullion is very desired by passionate collectors and experienced investors. Suisse Gold Bars are definitely one of the most sought-after gold bullion products on the precious metal market. The company has been producing the finest gold bars of .9999 pure gold since 1979 and mints gold bars of various sizes, from the smallest ones of 1, 2.5, 5, 10 grams and 1-ounce gold bars up to heavier gold bars of 100 grams, 10-ounce and even 1 kg gold bars. 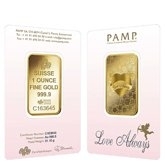 Each PAMP bullion bar is sold in housed in special packaging, or assay guaranteeing the bars metal weight and purity. The serial number is included both on the reverse side of the case and on the bar. Suisse Gold Bars are famous for their impressive designs, which include historical themes, religious themes, astrological and mythological motifs. Yet, the mint’s most popular design is, indeed, the ‘Lady Fortuna’ Gold Bar. She is the Roman Goddess of fortune, luck and chance and is depicted on the bar as wearing a blindfold with her hands holding a cornucopia with overflowing wealth. 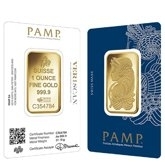 The second most popular design is the PAMP Suisse Lunar Series Gold Bars. The obverse of each bar represents one of the traditional Chinese 12-year calendar characters: Dragon, Snake, Horse, Goat, Monkey, Rooster, Dog, Pig, Rat, Ox, Tiger or Rabbit. Another well-known PAMP Gold Design is the Religious series which contains symbols, figures, and icons representing different religions, like Buddha, the Romanesque Cross, Lakshmi, the Ka ‘Bah Mecca and the Am Yisrael Chai. Other PAMP bar designs feature love symbols, botanical renderings, like the Rosa Gold Bar, cast look-alike, and newly designed concepts. 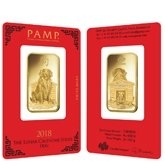 Moreover, PAMP Gold Bars are highly desired by investors and collectors because they carry low premiums, which means that their prices are as close as possible to the gold price per ounce.